Scottsdale Copier Rental has the most reliable copier rentals in Scottsdale. Renting a copier is a superior option, whether you have a mid-to-large size commercial business, a small business or a home based business. We have worked with all types of industries from school districts to industrial warehouse inventory and mortgage companies. Find the right copier to rent no matter what your budget. Don’t worry if you don’t have enough capital on hand – we can help you establish copier equipment to keep doing business. Scottsdale Copier Rental is your one-stop-shop for small businesses in Scottsdale. Whether you have a small commercial operation, an entire school district, or a one-person home-based business, we can help you find the right copier to rent. Copier rentals are not always easy to find, but you can ensure you’re producing quality documents and finished products with our copy machines. Contact Arizona Copiers today for a free estimate and schedule an onsite consultation. Today’s copiers allow your employees to highlight key features on work plans, edit documents or mark-up hard copies of documents and fax or email them quickly to others working on the project team. Copier rentals in Scottsdale are easy to find, but make sure you’re producing quality documents and finished products with quality equipment. Make sure to contact Arizona Copiers today. Renting a copier is a great choice if your small business isn’t ready to commit to purchasing a specific model. Try out different makes and models of copiers to see which ones are best for your type of business and which ones your staff prefers to work with. 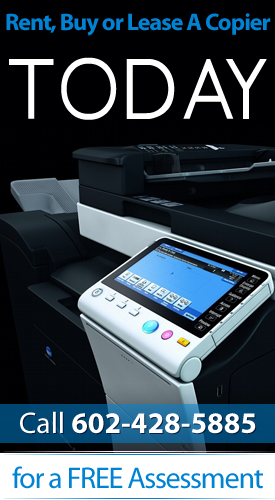 Try leasing a copier for a limited period of time before you make a commitment to buy. Scottsdale Copier Rental is a leader in digital imaging solutions. Our satisfied customers all over the world understand the benefits of excellent reputation and reliable products.